Plumbing emergencies require the assistance of vetted plumbers. We are a trusted and reputable company that has a skilled and competent team of plumbers who are ready to offer their help at any time of the day. Leaking pipes, blocked toilets or a broken dishwasher – the nature of your problem does not matter since our friendly experts can handle anything. Even though our plumbing services are of a top quality, our prices are more than reasonable. We have been in the plumbing business long enough to create a long list of services of which you can easily take advantage. If you are not sure of the exact cause of your plumbing failure, you can discuss it with our consultants or have our polite plumbers take a look at it and find the right solution for you. Install a wide range of plumbing fixtures that vary from simple taps, joints and taps to waste disposal units, showers, baths and white goods. Unblock kitchen sinks, baths and toilets and put an end to the source of leakage. We can also rod gullies and drains to eliminate unpleasant smells coming from your bathroom or kitchen. Our attentive personnel can also provide you with estimates on our plumbing services for your convenience, as well as a custom-tailored quote that will prevent you from exceeding your budget. The rates we offer are extremely competitive and our working schedule is very flexible. Domestic and business customers will both get access to top notch plumbing solutions by trusting us. We have the most well-mannered and amiable team of plumbers in London. 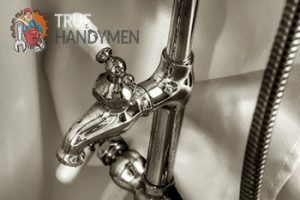 True Handymen has handpicked each of our employees not only based on professional skills and experience, but also the ability to communicate with customers politely and to easily build interpersonal relationships. Aside from that, our pluming experts are amazingly competent in their job and have sufficient training in detection services, newest plumbing techniques, as well as in domestic, commercial and industrial plumbing. The team of motivated plumbers that is employed by us, quickly responds to same-day bookings and successfully meets the latest industry standards. Apart from helping you with any plumbing emergencies in a professional and timely manner, we can also give you a hand in repairing the damages caused by a faulty pipe in your home or office. Our qualified and multi-talented plumbers have basic training in carpentry and wiring. In addition, by hiring our handyman services in London, you will not only enjoy assistance from our skilled plumbers, but also from our painters and decorators. Both teams often join hands when a plumbing project requires some repainting work, for instance, to fix any drainage consequences or a small repainting job. This in-house solution will further save you time and money.